I still don't own Sahara Sand, so I used Crumb Cake instead. I think it works okay with the other colors. I'm not sure what was going on with the lighting today, but I could not get a good picture that showed the true colors. I think I ended up hitting too many buttons on Photoshop too so I might have even made it worse! I hope you can get the idea though. :) I'm in denial that my lovely kites are retired. I love them and will keep them forever. I'm still stamping away and decided to continue my streak today. I figure if I need to rest I might as well have fun doing it, right? Hopefully the creative process will be relaxing and get my dang blood pressure back down! :) Today I finally had an idea for the LeAnne's sketch at the Paper Players. I've been running ideas through my head all week but nothing clicked until today. I'm glad I waited because I really LOVE how this one turned out! It's my turn to host the challenge at Freshly Made Sketches this week! It's my last one before I take a break for maternity leave. I will miss it, but I am officially TIRED. These next 5 weeks are going to be long with the temperatures up in the 90s and my feet nowhere to be seen! Well if you've been by the FMS blog you know that this week I was blessed with the sweetest surprise from my DT members, the lovely ladies from the Paper Players, and my sweet friend Kathy. They shocked me and organized a baby blog hop that I was clueless about! 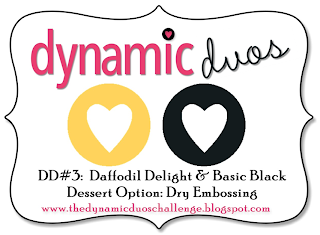 The FMS ladies even made decoy cards to post on our DT blog so that things looked normal! I'm still surprised and have been crying over their beautiful gesture all morning. Be sure to go follow the hop and see all the gorgeous creations that they made using my sketch! 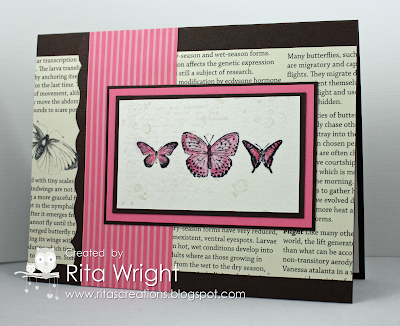 When I sat down to stamp I had intended to do a very distressed card. After looking at the design team samples, I realized they are more into clean cards without a lot of fuss (aka distressing) so I decided to go with what I'm best at and do a somewhat clean-and-simple card. 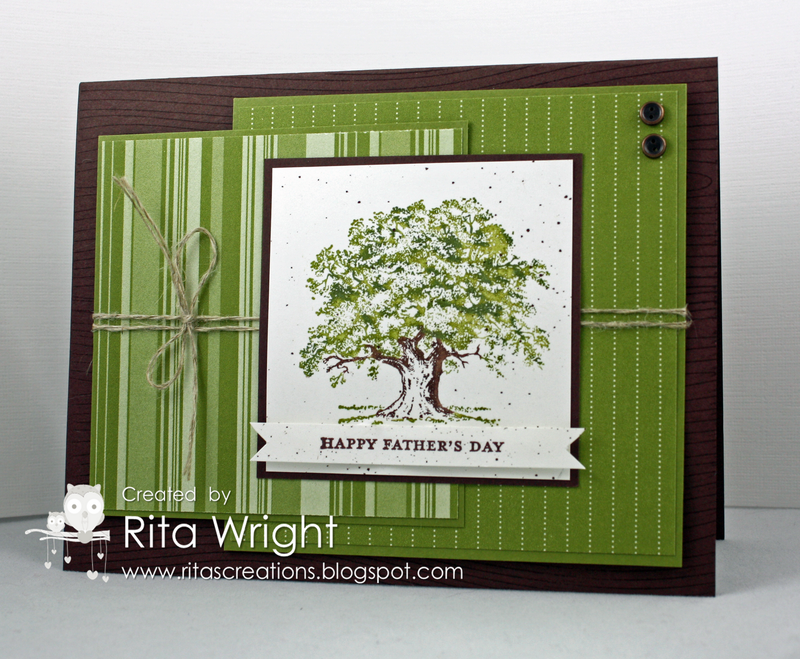 For some reason Father's Day and Christmas are the times of the year that I am really drawn to use Lovely as a Tree. It just works so well for both! 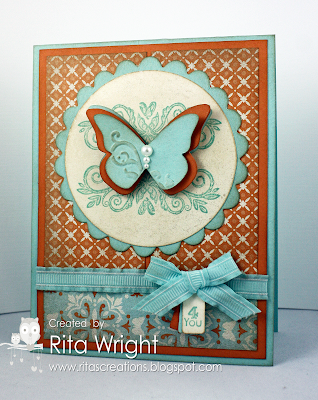 I'm trying to use up more of my hoarded designer paper, so you'll probably be seeing a lot of retired paper on my blog. Sorry for that, but there's only so much space in the craft room and it's too pretty to throw away! Now that I'm feeling better during the day, I've been taking advantage of it to get some stamping done. When I saw the new challenge from Dynamic Duos today I just had to go play along! I'm not one to jump at color challenges, but I love this one! 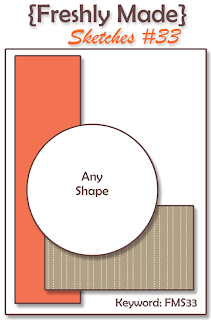 Two colors and neutrals are much easier for me to work with than 3-5 colors! I kept my card pretty simple, but I think it turned out pretty cute! Make a project for " That special Man in your life ". Or Make a project with the " Sketch ". 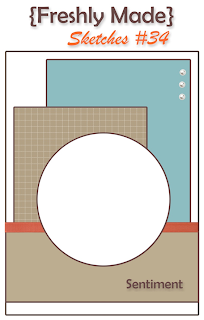 Or "Mash it Up" and create a " Masculine card using the above Sketch ". Know that old saying better late than never? Well, that's me this week! I had actually decided to take this week off from The Friday Mashup because I was feeling so bad, but after some new medicine and a night of sleep, I felt like stamping a little today. Holly has such a great challenge that I didn't want to miss out playing along. Now this will be my last card before I'm "officially" on maternity leave, but I still want to try and do some of the challenges if I can fit them in. It depends on how I'm feeling and then how recovery and motherhood go if that happens or not. I can't believe it's only 38 more days! Yikes! Anyway, on to the card, right?! I pulled out some retired designer paper that I really need to stop hoarding use up and the classic Lovely as a Tree stamp set. It's an easy choice for a masculine card. I did a bit of "thumping" on the tree to get in some different shades of green; one shade was just a bit boring. 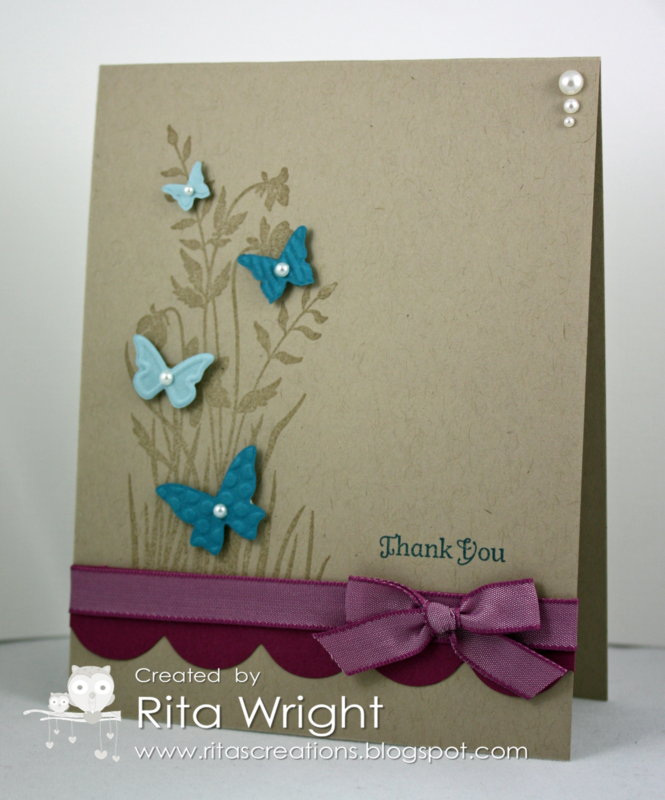 :) It's a pretty simple card, but it's hard to go all out with embellishments when you are doing something for a man. Ribbon and bling just don't work without some serious creative effort! I hope you'll come play along with us this week! 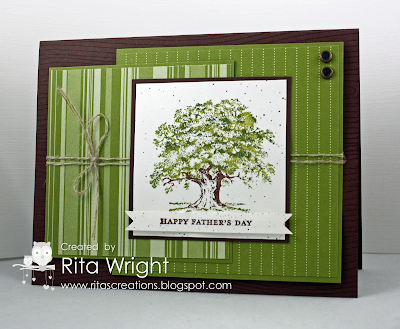 It's a great time challenge to get your Father's Day cards made before June hits! It's time for another new sketch from Freshly Made Sketches! Tui is the hostess this week and came up with this awesome sketch to challenge everyone. I'm still feeling a bit under the weather, so I'm taking off this week. I will definitely have to work on this sketch once I feel like sitting at my desk though! It's a fun one for sure. Go check out the awesome work that the design team and guest designers created to inspire you this week! One of my customers has expressed interest in the Aquapainters, Blender Pens, and Watercolor Crayons. Those are not my strong points, so I've decided I need to practice a bit over the new few weeks before club night! I really want to demo the different coloring techniques and the only way to get better at it is DOING it, right? So...here's my first attempt. I used the gorgeous butterflies from Kindness Matters. I used the crayons and aquapainter for the large one int the middle and the ink pads with a blender pen for the smaller ones. They are okay, but I definitely need to work on my skills! :) If anyone has any tips, I'd love to hear them! Don't pass out because I've posted a few days in a row! I might even have something else for you tomorrow too, so maybe you can fall over then. Ha! 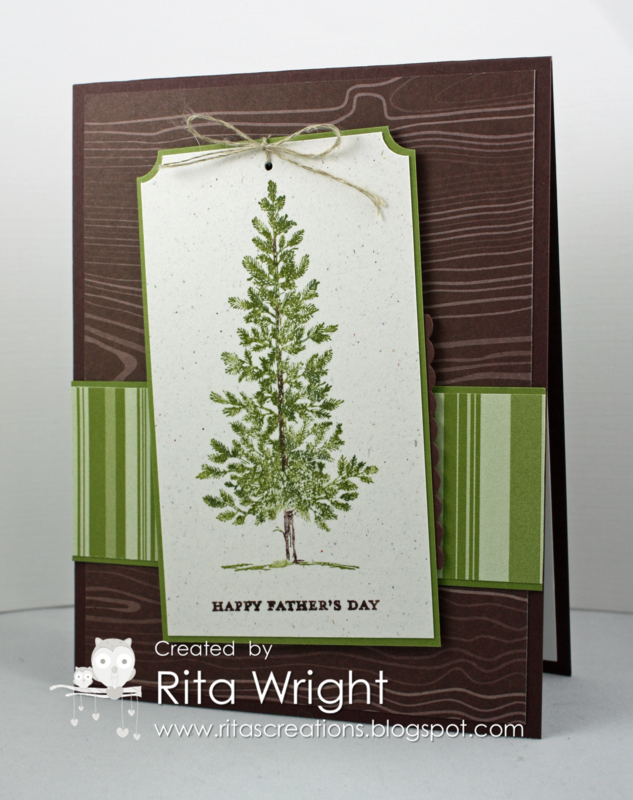 I wanted to share another card that I made yesterday morning. Getting up at 4am really allows for some serious stamping time, especially when the husband has already informed you that he's sleeping in until 1pm! 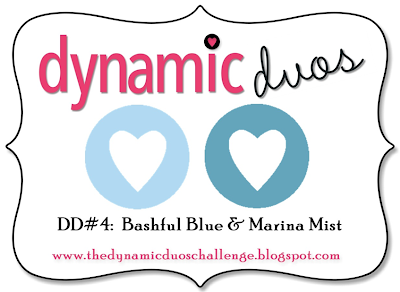 I fell in love with the sketch at clean&simple this week and couldn't resist the colors at Dynamic Duos. I had to pull out Fun Flowers for that sketch! It was just too perfect, right? I love making cards that have little to no stamping on them. I find that it's pretty easy to do that with this die. The sentiment is from Kindness Matters, but everything else is just paper, punches, dies or embossing folders. I love all the layers and texture and seriously? Those colors just rock when you put them together! Well, after waking up at 4am this morning, I decided I should try to go stamp for a bit. 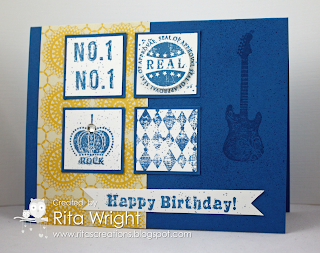 I actually finished 3 cards and had a nice time stamping just for fun. With pregnancy, two design teams, and club/class cards, I don't often find time to do challenges or make a card just because I feel like it. I definitely need to get back to that; it was relaxing and just plain old fun today! 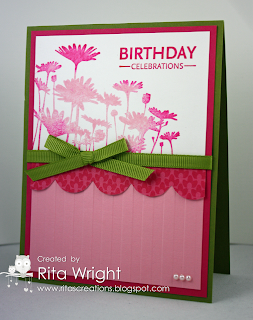 My first card combines two challenges, the gorgeous colors of colourQ and the fun polka dots of the Paper Players. I'm really going to miss this set. I bought it to challenge myself and fell in love with the fun images. I always enjoy using it and to me, that's a sign of a great stamp set. 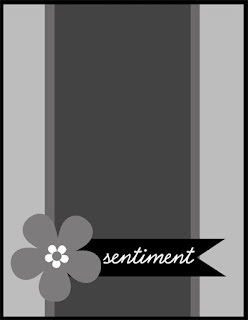 :) We used a strip of the retiring Flirtatious DSP in Daffodil Delight. I think that pattern was non-girly enough to work. Ha! Our next card was the feminine version of the card and my favorite of the three. It was inspired by Deb's beautiful card that you can see here. Fox & Friends is the set that I'm most sad about losing. Well, not losing because I will be keeping it, but not using it for classes I guess I should say. It's my favorite set for kids and it has definitely earned it's keep over the past few years. If I had to recommend one set that you should get before it's gone, it's this one! 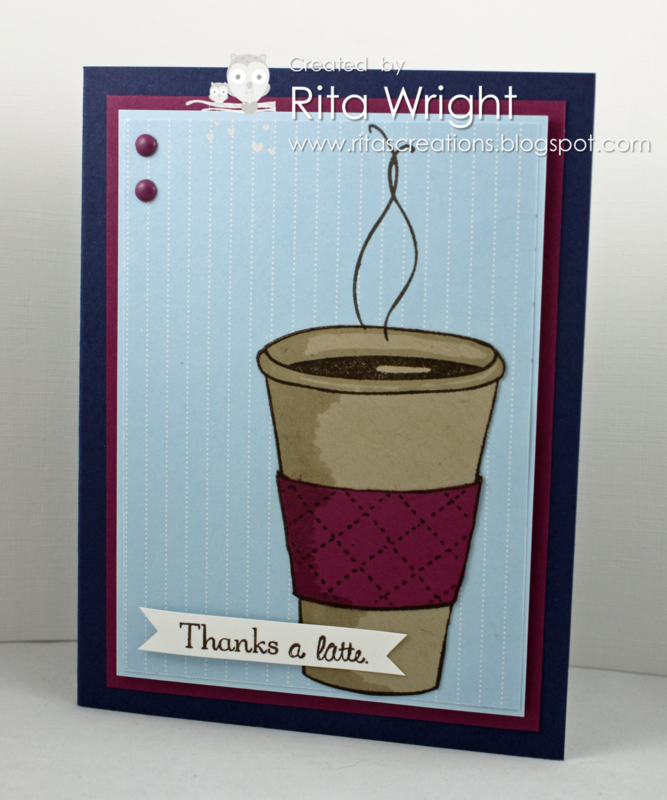 I also used a small strip of another retiring dsp, Cheerful Treat. It was a hostess choice this year and I got so much use out of it. I just love the fun bright colors! I hope you enjoyed the projects! I want to do more of these, so you'll probably see quite a few sketch trios in the future. Just to update, my labs came back okay and I am NOT on bed rest nor do I have pre-eclampsia! My blood pressure is still a little high and I have awful congestion/headache, aching ears, and a cough. I'm hoping that will clear up soon as it's tiring to feel so yucky all day. It's only 44 more days until our little girl is scheduled to be here! 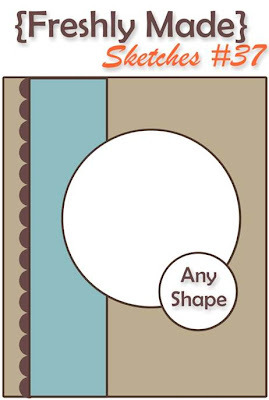 Make a project " with a Decorative Edge! " Or Make a project with " Ribbon and/or a Bow. " 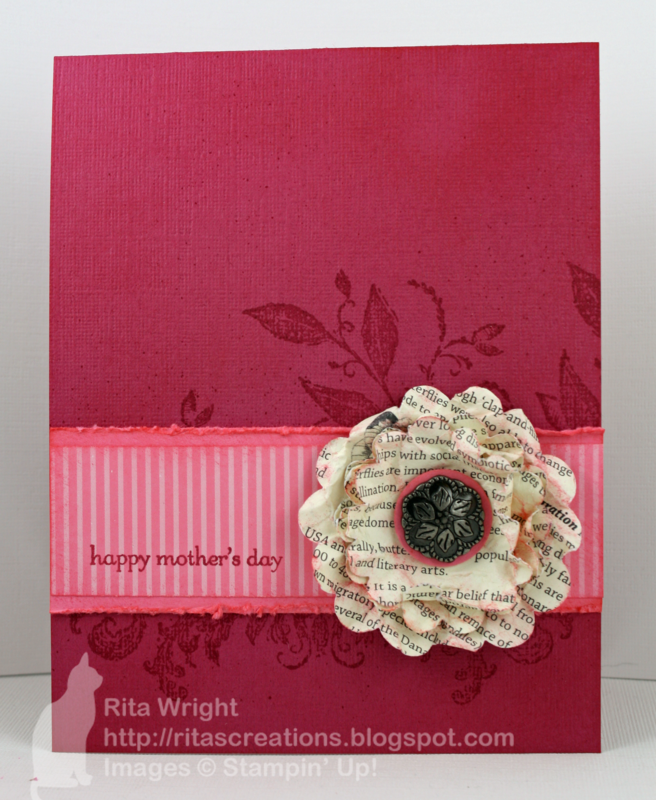 Or "Mash it Up" and create a project " with a Decorative Edge & Ribbon ". 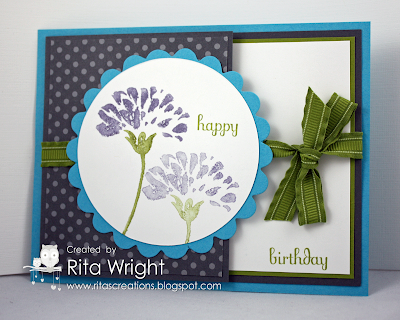 One of my recent goals is to work on clean-and-simple cards, especially those that are mostly one layer. With a new baby coming soon, I know my budget and time are both going to be decreased and I figure the "less is more" philosophy is a good one for me to work on adopting. I do find this style difficult, so you'll have to bear with me as I fumble my way through figuring it out. I do like this one a lot and think it turned out nicely for such a simple card. I even managed to fit in the decorative edge and the ribbon/bow without going overboard (I think anyway). I hope you'll take the time to come play along with us this week and to wish Kasey well as she moves on to future endeavors! 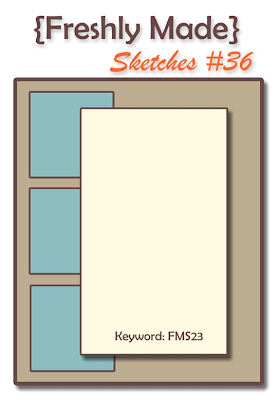 It is Wednesday and time for another sketch from Freshly Made Sketches! Jen T. is our hostess this week and has this fun three-panel sketch to challenge everyone. 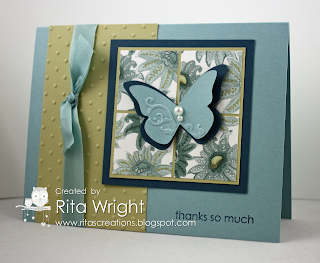 It took me a bit to figure out what I wanted to do with my card, but with the help of my friend Marla I finally settled on some embossed panels. What do you think? I had to use the adorable Butterfly Prints set. I haven't had it very long and it will be retiring at the end of this month. :( Of course I'll keep it because I tend to use retired stuff if it strikes my fancy. I love having lots of options! Come play along with us this week! Be sure to stop in and say hi to the other design team members and our awesome guest designers! For our sketch card I did a bit of a remake on one of my Freshly Made Sketches cards. I wanted to use the awesome vine image from Best Friends Forever and it worked perfectly on the base. 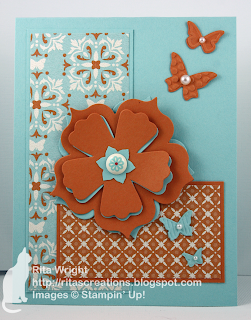 I also toned down the colors a bit by using So Saffron instead of Daffodil Delight. Our technique this month was the rock n' roll technique and Dawn's gorgeous card inspired me to create this one. Upsy Daisy is just perfect for so many techniques, so I know many of us demonstrators are going to miss it. 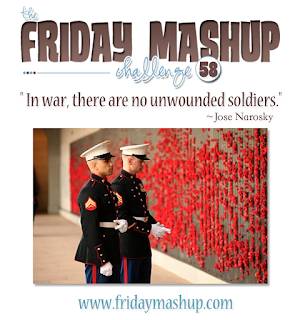 If you are looking for my Friday Mashup post, please click here or scroll down. Our first card was the feminine version! I used the same colors from my Freshly Made Sketches card this week because I am really loving them! (I know, PINK!) 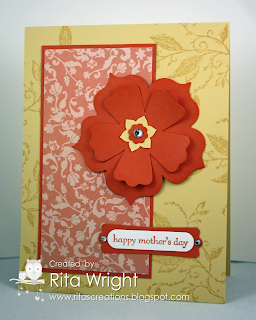 I kept it fairly simple, just added a bit of stamping on the card base with a small stamp from Raining Flowers. Our next project was the masculine version and of course I had to use The Open Sea! 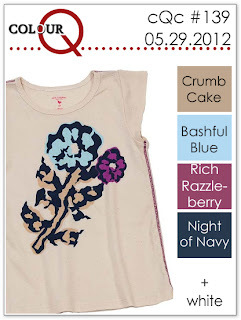 The Color Coach gave me this gorgeous color combination; it has two of my favorites, Crumb Cake and Not Quite Navy. For this one we used a background stamp on the card base, the Netting stamp. It adds a bit of interest without taking away from the main image. 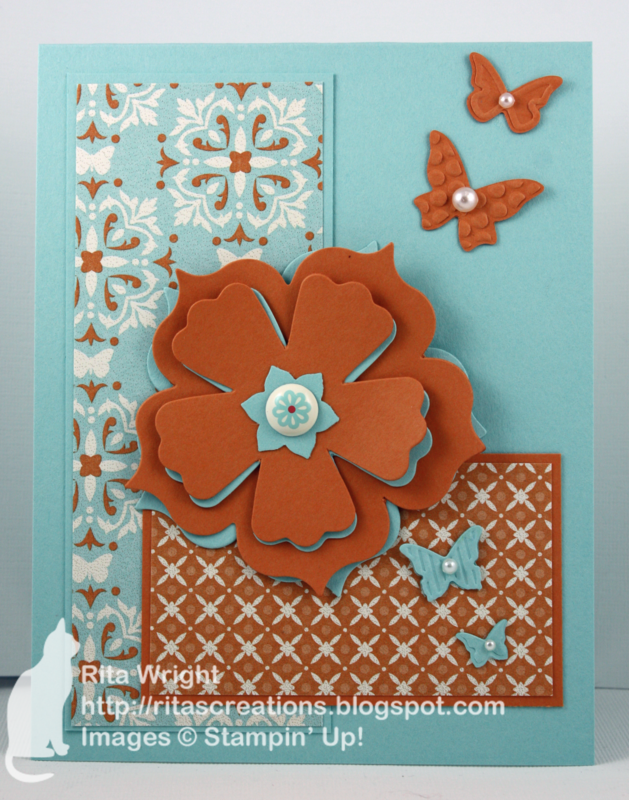 We also embossed the Top Note with the Houndstooth embossing folder. Our final project was the child version! For some reason I just love this one; it seems fun I guess? 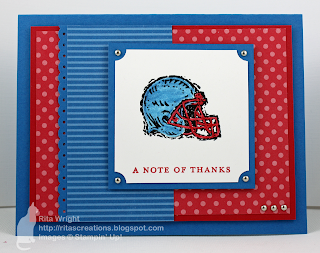 We left the card base plain this time, but embossed the Top Note with the Stripes embossing folder. Button Buddies was being neglected, so I thought it would be the perfect image for this one. 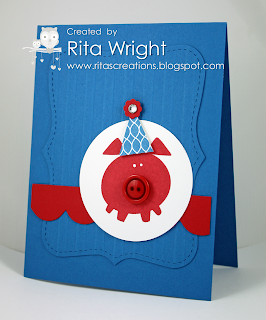 I used the pennant stamp set and punch to give Mr. Piggy a party hat with a bit of bling. Isn't he cute? 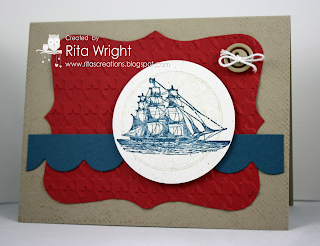 Make a project that's "Patriotic or for Remembrance". 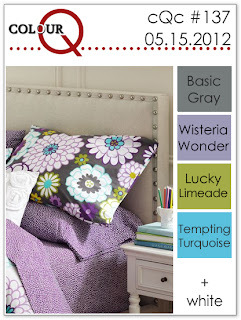 Or Make a project with the colors " Whisper White, Night of Navy, Poppy Parade & daffodil Delight." Or "Mash it Up" and create a "Remembrance or Patriotic project using the colors above." Donate your card to a Wounded Solider or that Special Service Member in your Life! * If you would like to Donate a Card to a Wounded Service Member you can send your cards to Holly. The Red Cross at the Walter Reed National Medical Center will accept the cards and distribute them to Wounded Service Members throughout the hospital. 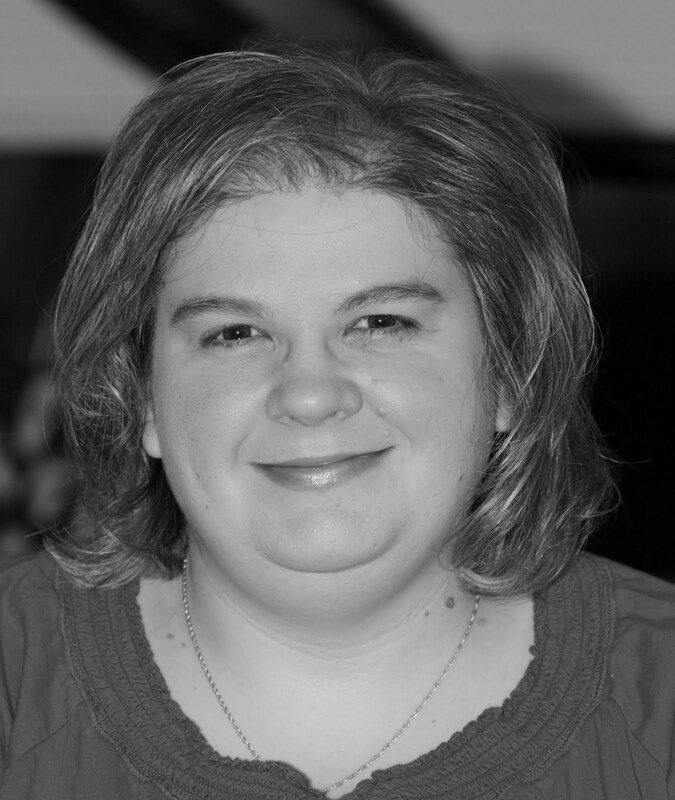 Please send your cards to Holly Endress P.O. Box 18 Arnold, MD 21012 no later then May 31st. She will be hand delivering them to the Red Cross. 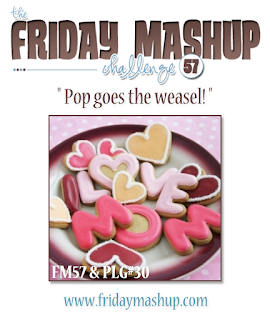 This week is a special week at The Friday Mashup. Lisa has asked to focus on Memorial Day and remember our fallen troops. I didn't feel that I really had stamps to do her challenge justice, but I did my best. 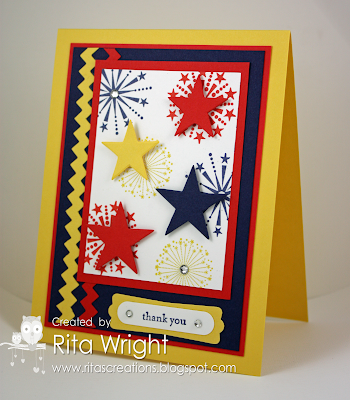 I pulled out my retired July Fourth stamp set and my stars die to work with the colors that Lisa requested. I hope it turned out somewhat patriotic? Yesterday was a long day and by the time I saw down to stamp I was pooped! My mojo is almost gone completely, so it's probably good that I'll be on "maternity leave" after this month. You guys will be starting to think a kindergarten kid was making my cards! I hope you'll come play along with us and honor all those brave men and women who have sacrificed their lives for our beautiful country. How did it get to be Wednesday already? I think I missed Monday and Tuesday somewhere! 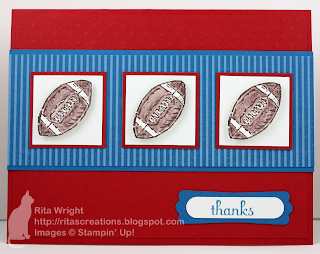 I was way behind getting my stamping done this week, so I had to rush last night to get my card made! Anyway, Wednesday means a new sketch from Freshly Made Sketches! Lesley is our hostess with the mostest this week and she's whipped up this fun sketch with lots of layers! Pretty cool, huh? Come join us this week as we love to see faces both old and new! Make a project for "Mom, Grandmother, Aunt etc...". 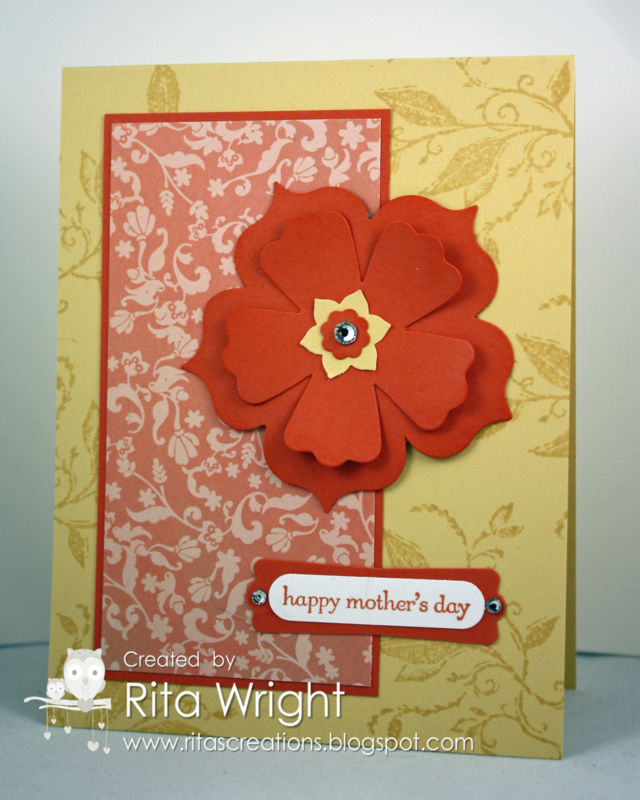 Or "Mash it Up" and create a " Pop-Up Project for Mom". Or join in Both challenges and create a "Pop-Up Project for Mom using the inspiration photo above." 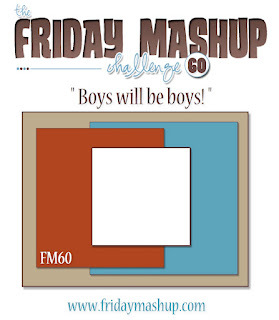 The Friday Mashup is teaming up with Paper Lovin' Gals this week. 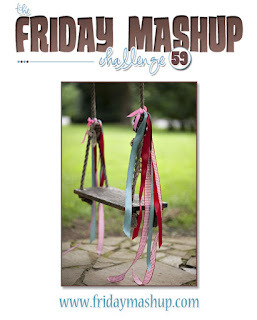 They use fun inspiration photos for their challenge, so if you mash up our challenge plus use the inspiration photo above, you'll have a triple play! 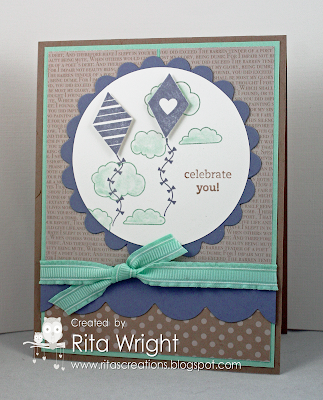 I am still playing around with my retiring stamp sets and pulled out a favorite, Best Friends Forever for this card. This is a pretty simple card for me which means it was a struggle of course. 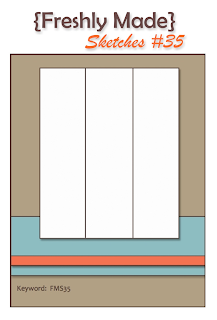 :) I tend to stress out as the number of layers decreases. I did use some gorgeous textured card stock and some slight distressing so hopefully you don't miss the layers too much. I'm currently the healthy one in the house. Jason is recovering from his surgery (which did go well) and my mom is having issues with her shoulder. I'm glad my arm/wrist quit hurting because I've had a lot to do this week! Tonight is stamp club and tomorrow is my baby shower. I'm hoping Sunday is a day of rest for all of us. Forgive me for a short post today. I've somehow managed to hurt my right arm, wrist. and hand and am typing with my left hand only. Not easy, but I figured I should go ahead and get used to one handed tasks; Laila will be occupying a lot of my space soon enough! 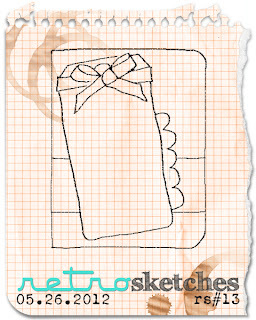 :) Jen M. is our host at Freshly Made Sketches this week and challenged us with this fun sketch. 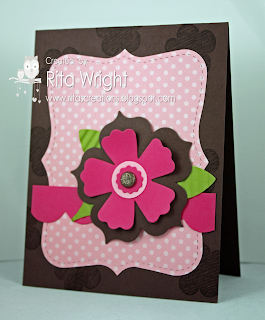 I'm having a renewed love affair with my Fun Flowers die lately! 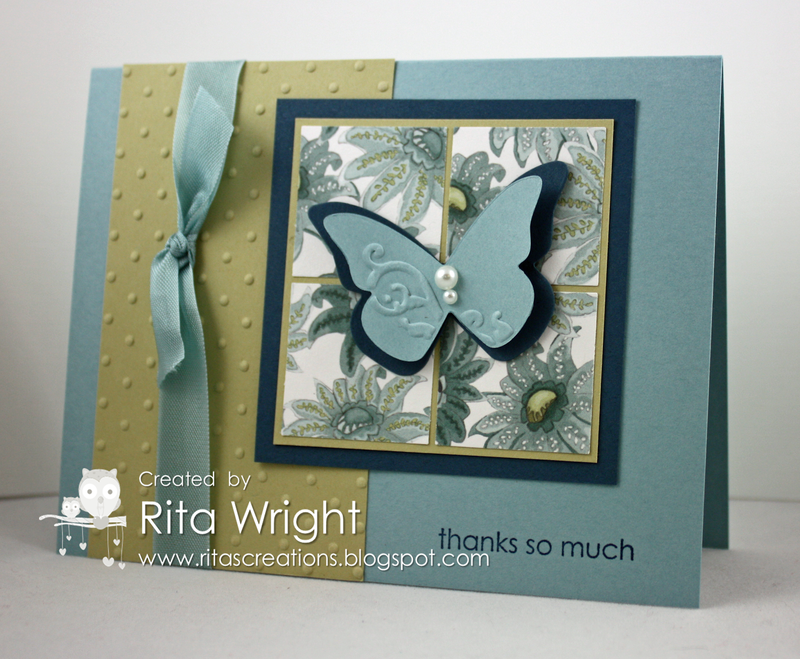 I paired it with another old favorite, the Beautiful Wings embosslit. I needed a pretty card for a good friend's birthday and I hope she liked this one. 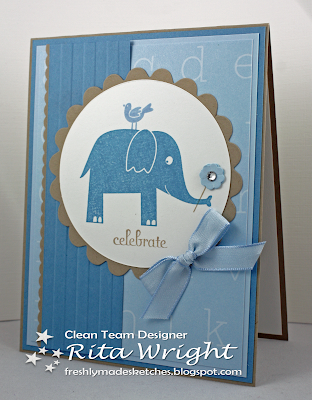 Be sure to check out all the fun interpretations by the design team! We are also having a call for guest designers, so check that out too! Finally, my husband is having his gall bladder removed today, so keep us in your thoughts.